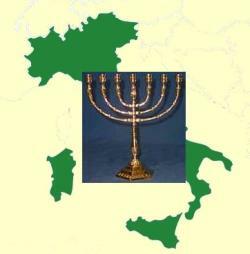 (Nov. 25) - This year the Jewish community of Naples marks with a special exhibit 150 years of existence in the city since its rebirth in 1864, when, shortly after the unification of Italy (1861), the Spanish Expulsion Edict of 1541 was revoked. The exhibit will be at the National Library (on the premises of the Royal Palace) at Piazza Trieste e Trento. On display will be liturgical items, documents and photography both from library sources as well as from the national archives. The 1541 expulsion had been preceded by earlier ones of 1510 and 1503 as the new kingdom of Spain (united in 1469 by the marriage of Ferdinand of Aragon and Isabella of Castille) little by little replaced the Crown of Aragon, which had been the sole ruler of the Kingdom of Naples and had been relatively tolerant. The Spanish had begun to expel Jews almost immediately from Spain in 1492. By 1541 they had a solid rule on Naples that would last until 1700, and they issued the infamous edict. The Bourbons (starting in the early 1700's) never revoked the edict, but Garibaldi and then the new Savoy rulers (in 1861) instituted a policy of religious pluralism and provided for the re-founding of a Jewish Community in Naples and even the institution of a Jewish university. Among the rare items on display at this exhibit are a Hebrew book printed in 1492 and a Hebrew-Latin grammar published in Venice in 1522. There will be a number of items from the 1800s connected to the famous Rotschild family, readmitted to Naples by the Bourbons in 1821 to open a branch of their bank in the city. It was the Rotschilds who then rented the premises on via Cappella (later bought by the members of the community and which today is still where the synagogue is located). Documents from the infamous racial laws of the 1930s and from the period of the Holocaust will be on display. The curator of the exhibit is Professor Giancarlo Lacarenza of the Oriental University of Naples; the exhibit runs through December 12 at the library and again from January 14-28 at the National Archives. (Nov. 26) - I comment elsewhere that just as washing windows on a skyscraper is an endless job (when you finish, it's time to start over), so, too, is the task of restoring, resurfacing and just plain shoring up old buildings in Naples. Currently many large structures at Piazza Plebiscito are in the process of being restored, both cosmetically as well as in the interest of public safety. This includes the entire western facade of the royal palace (image, right), much of the surface of the San Carlo theater and of the Galleria Umberto, both about 50 meters to the left of this photo. As is now customary with such tasks, gigantic scaffolding is erected against the side of the building — thousands of pipes braced and locked together to hold planks for workers to stand on. And, as is also customary, the entire affair is then draped with large sheets of vinyl imprinted with computer-generated images of what the finished product is going to look like. That is what you see from the outside—a nice picture, what they now call a "wallscape." You can't see through it to the workers scurrying around doing the restoration boogie, or perhaps notice that, hey! there's no one back there! (Nov. 26) - The latest James Bond film still hasn't got a name, but the cast and crew are shooting out at the grand Royal Palace in Caserta. Architect Luigi Vanvitelli's vast palace is a perfect set and has served in that capacity as far back as 1942 in a wartime bit of Italian fluff about three young air-force cadets. (Not too long after that, it served in quite another and very dramatic capacity: it was Allied Headquarters in Italy until the end of hostilities in May, 1945. It was here on April 29, 1945, that all Fascist Italian forces surrendered and where, on May 1, all German forces in Italy signed an unconditional surrender.) Most recently, Richard Dreyfuss played the role of Vanvitelli in Caserta Palace Dream, directed by James McTeigue. And there have been dozens of others along the way. The Baroque magnificence of the place lends itself well to certain kinds of scenes. If your film has to look like the inside of the Vatican, but the Pope doesn't want you and your crew traipsing around, Caserta is your Plan B (as in Angels and Demons with Tom Hanks). Before that, Mission Impossible 3 showed you the Vatican by using the facade of the Caserta Palace and digitally adding the dome of St. Peter's! (image, above, from La Repubblica ). (Those people are going to Hell, believe me!) The Caserta palace even showed up in a couple of Star Wars movies. The needed a grand Throne Room on the planet Naboo. Or something like that. (Nov. 26) - I was not aware of how many associations there were in the world that promote the writing of literature for children. The Italian Children’s Writers Association’s (ICWA) “promotes Italian children’s literature...[and aims]...to renew the literary tradition of such internationally renowned children’s authors as Carlo Collodi [author of Pinocchio] and Gianni Rodari.” There are, indeed, international organizations such as the Society of Children’s Book Writers and Illustrators... specifically for those individuals writing and illustrating for children and young adults in the fields of children’s literature, magazines, film, television, and multimedia...” and IBBY, the International Board on Books for Young People, which presents an annual Hans Christian Andersen Prize. Many such groups cooperate with the UNESCO Education for Sustainable Development program, which this weekend presents in Naples through our local ICWA affiliate a workshop entitled “Scampia Storytelling” dedicated to the lives and formidable storytelling talents of the children of the Scampia section of Naples, one of the most underprivileged sections of the city. (Read at that link to see what these children are up against.) The organization has a website in various languages, the goal being to translate the Scampia stories into other languages as well as to solicit the stories of children from around the world, a children's international fantasy network, if you will. This is amazingly worthwhile and important. (Dec. 1) - This is about chestnuts! An earlier item on the chestnut crisis is here. (Go read it and then come back! There's a return link.) There, that wasn't so bad, was it? So, the crisis is still here, and many sources paint a picture as bleak as ever. 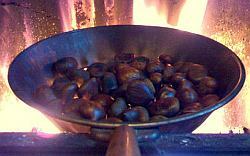 Production is still way down and the once thriving chestnut industry in Italy is still in trouble. BUT! —enter biological warfare in the person of—or insect of—Torymus sinensis, parasite and mortal enemy of the Oriental Chestnut Gall Wasp (OCGW) (I told you to read that link!) Tory Sin is a wasp introduced into chestnut groves in the region of Emilia-Romagna (capital: Bologna) a couple of years ago after early reports from other areas, including some in Switzerland indicated positive results. Reports from the north now claim the OCGW infestation is down sharply, but still say that a few years will have to pass to be sure and for there to be any real hope of regenerating the chestnut industry. Now, here is a charming episode about chestnuts. (Dec .1) - The 25th edition of the provincial capital "Quality of Life" report card! Every year the financial newspaper Il Sole 24 Ore issues just such a report ranking the capital cities of all 107 provinces in Italy. They use a number of standard parameters by which we judge how livable life is in a particular place: rate of unemployment, public transportation, public health and sanitation services, crime rate, access to leisure time facilities, and so on and so forth Then they issue a list of all 107 places that looks like what you see here on the right: this year's ranking, point score, last year's ranking, and whether you are moving up or down. OK, will you open the envelope please... and the winner is...Ravenna! (Ravenna would like to thank her mother, her agent, her friends and her dog and promises to work for world peace.) Dead last was the city of Agrigento in Sicily. Been there. No, not to Agrigento —been dead last. Naples was 107th in the 2013 edition. This year we have gained a bit, in at 96. Still some room for improvement. Looking at the entire list, the north-south split in Italy is still obvious. Quality of life is better in the north, at least judged by the economic and social parameters that the newspaper selected. Also, large-towns (or small cities) tend to do better. Among the four major large cities in Italy, only Milan was in the top ten. Rome was #12 (not bad! ); Torino was 54th (trouble up north? ); and Naples, as noted, was 96th (but moving up on the outside and closing fast). "OK," said mayor De Magistris, "maybe we haven't got the best services, but for excitement, we're second to none." (Dec. 1 ) - At last , It took them 50 years to do it, but they finally blew the ecomonster of Alimuri (on the Sorrentine coast) back to the hell that spawned it. The original item in these pages is from last March, here. It happened yesterday, and the folks turned out to watch. There was a special tribune for VIPS and journalists and boats set out from Sorrento with paying customers just to see the spectacle. There was even a guy out swimming nearby. (I'm not sure what happened to him.) It took twelve seconds. Well, actually 50 years and twelve seconds. (Dec 3) - Here's another good reason to go to Ischia. The famous Aragonese Castle on the island is home to the European Institute of Restoration (E.I.R. ), a major center in the sector of heritage conservation and restoration. The institute offers certificate programs and Master courses in such things as the conservation and restoration of wood artifacts, underwater archaeology, restoration of mosaic flooring and murals, photography of works of art, restoration and conservation of wall paintings, etc. etc. The list is quite impressive. There are monthly, half-year and one-year courses. I found all this out just this morning while watching the news. I didn't know there was even such a thing as the E.I.R. and now it seems they have just received five XXI dynasty Egyptian sarcophagi (pictured) from the Musées Royaux d’Art et d’Histoire of Brussels. They also showed some x-rays of the mummies inside the sarcophagi. They were showing the public and tv news crew around before they start to work on restoration. (I really don't know and am afraid ask what they do with the mummies while restoration is going on. What a plot for a bad horror flick! Honestly, one of the lady Ph.D.s bore a strange resemblance to Boris Karloff.) You can get in and tour or at least look at some of the facilities. If you want to take some classes, there are scholarships available. Don't write me, please. 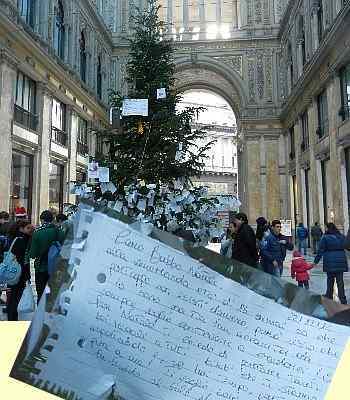 (Dec.4) - There will be no "wishing tree" in the Galleria Umberto this year. Well, there was one until the city had it removed yesterday because it wasn't "properly licensed". That, of course, was a flimsy excuse and everyone knows it. They also removed the large hanging star from the gallery. The tree and star were removed because relatives and friends of Salvatore Giordano staged demonstrations in the Galleria, protesting that it was disrespectful to the memory of the boy to put up festive decorations at the very spot where he was killed. (The incident is reported at this link.) The city caved in, and I agree that it is very possible and very human to have mixed feelings about the matter. The mayor was on the other side (as am I). He apologized sincerely to the parents of the boy but expressed his view that such a holiday as Christmas by its very nature can be solemn as well as festive and can also be a time for remembering those who are longer with us. On the other hand--speaking of caving in--there is a good reason NOT to have thousands of persons going through the gallery. You don't need any more tragedy; there is enormous delay in getting on with the necessary repairs to the gallery. With scaffolding and platforms in place waiting for repairs to start, the place doesn't look that festive, anyway. (Dec. 7) - It's beginning to sound a lot like Christmas. I saw my first yuletide zampognaro this year —a tad early, I'd say. They are supposed to start playing at the beginning of the novena, the nine-day period before Christmas. I'm talking about the gentlemen pictured here on the right —the Christmas shepherds, one of whom plays the southern Italian bagpipes called the zampogna, while his companion plays a double-reed folk oboe called the ciaramella. I saw the piper. He was not yet playing, but rather scurrying down the street saying "buon natale" to people as he went, probably looking for the other half of the band. When they finally hit it, they'll play the same carol over and over: Tu Scendi dalle Stelle (See that link. Pope Pius IX is probably still held up in Copyright Limbo over that one!) At this link, there is page of other Christmas entries; the fourth one on the list is about the Christmas shepherds. Also see this link about old-time professions. (Dec 8) - Italian national TV ran one of its usual good travelogues the other night. This one listed the 10 loveliest churches in Italy—'lovely' with a capital LOVE because these were the “perfect places to get married.” City Halls need not apply. It's all pretty silly, if you ask me. When you're in love, maybe any place is good, even perfect. I got married in a chapel with a wind mill. It was nice. If you are married, I hope you got married in a nice place, too. But for what it's worth, number one in Italy — at least according to the TV cupids — is right near here, so...open the envelope, please. The church is the Santissima Annunziata in Vico Equense (pictured), a coastal town on the western side of the Sorrentine peninsula, about halfway between Castellammare di Stabia and Sorrento. It is perched up on a cliff and has a breathrending view (I can't make up my mind!) 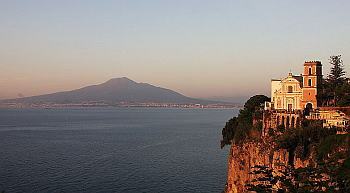 of the Bay of Naples—Capri, Ischia, Vesuvius, sunset. The site, itself, Vico Equense, has a long archaeological history, as do most places around here, going back to before the Romans. This particular church was built at the beginning of the 1300s and is an unusual combination of Gothic architecture inside and Baroque outside. The facade was, in fact, rebuilt in the 1700s. (Dec. 24) - The following paragraph describes the musical instrument shown in the image (right). The paragraph is from another entry in these pages on typical folk instruments. 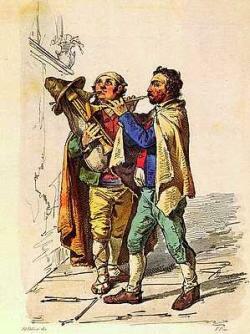 Among the percussion instruments widely used in folk and popular music in Naples is the so-called caccavella...This term can often be used in a non-musical context to mean "broken down old wreck"—for example, as applied to a car; the instrument is also known as the putipù, onomatopoeia for the "burping" sound the instrument makes when played. The instrument consists of a membrane stretched across a resonating chamber, like a drum. Instead of the membrane being struck, however, a handle is used to compress air rhythmically within the chamber; the air then spurts out of the not-quite-hermetic seal that fastens the membrane to the wooden body of the instrument. The sound is reminiscent of the sound you get when you cup the palm of your hand into your armpit and snap the upper arm down—(not that you would ever do such a thing). The painting, itself, has just appeared in a calendar for the coming year put out by the great art nouveau cafè, Gambrinus, right across the street from the Royal Palace. Every month has a painting of "Naples of the 1800s." To my non-expert eye, they all seem to be from the late 1800s, that is, the period associated with "Liberty" art and architecture. If you search various art web sites for paintings called Il suonatore di putipù (the Putipù Player), you'll get a few hits, even one from the 1600s — but you wont get this one. At least I didn't. I even searched "Boy serenading girl by making rude (but rhythmic) noises." No dice. Solution? Go down to Gambrinus and get a calendar; the pages are all identified with the title and name of the artist. No can do. They printed only 500 of them to give to their "best clients." I, of course — who have led thousands of tourists into that place to spend their money on insane amounts of gooey pastries — don't count. The mayor counts, as do any number of other deadbeats. So I have written, again, the Goddess of Research, Selene Salvi of Napoli Underground, and am awaiting her reply. In the meantime, am I just a dirty old man, or there is some sort of a huge single entendre in here that only I see? (Two minutes later) Hold it...I can't believe she has already answered me! The name of the painting is Scugnizzo (a local term for what used to be called in Dickensian English, a "street urchin" or "ragamuffin"--see this link.) 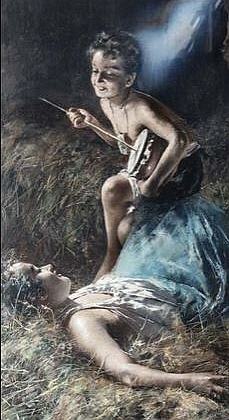 The artist is Vincenzo Volpe (1855-1924). He was trained at the Academy of Fine Arts in Naples and wound up as its director. Many of his early works are at the Capodimonte Museum. (Jan 1,'15) - Most of the time, New Year's Eve and New Year's Day are the same old same old: thousands of people in Piazza del Plebiscito for music and fireworks, 46 persons injured in Naples in fireworks-related incidents (I don't think that's a record), local polar-bear club goes for a morning swim in the sea, etc. This year, it was cold, at least for us. Three degrees below zero C./27 F. at 6.30 in the morning of the 31st with snow in various quarters, leading to activity on the part of ever-industrious Neapolitans (image - from Il Mattino). It all seemed rather tame this year. It was probably the cold. That has already changed. Today is 11 degrees C. warmer than yesterday morning. Tomorrow will be even warmer, they say. I complain, I know, but at €.50 a snowball, who wouldn't? 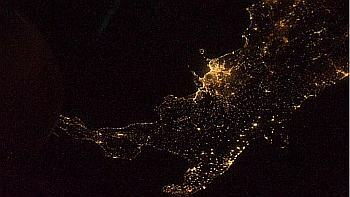 (Jan 3) - I couldn't resist this night-time shot of southern Italy taken from the International Space Station. Two points: one, Naples certainly uses a lot of electricity, and, two, I think I left our lights on. Not sure about three...they have NO electricity on Sicily? First - today is Befana, the last of the traditional "Twelve Days of Christmas" and the traditional end of the holiday season. In the old days, before the syncretistic spread of northern Christmas traditions, it was the gift-giving time of the season in southern Italy. Now, it's the second half of a twofer. And if you were born between Christmas and Befana and also have your name day in there somewhere, you either became one very spoiled child or a very disgruntled one when you got just one present for everything. 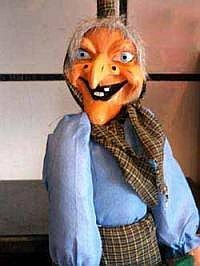 Befana is shown as a witch-like old hag who leaves either a gift for the good child or a lump of coal for the bad one (more at these two links, here and here). For the record, Italians are not familiar with the looney English song that starts "On the first day of Christmas, my true love gave to me...", although I did get my Italian high-school students to sing it. They were very good at remembering the 'Lords a-leaping' and 'Geese a-laying' and very good at figuring how many gifts there were in all. The answer is not 78, by the way, because it isn't 1+2+3+4... etc. but really 1+(2+ 1)+(3 + 2 + 1)…etc. So we figured it was 364. One kid said, "What about the cows? The maids had to be a-milking something, right?